Regular readers of this blog may recall previous posts about something called the European Beer Bloggers Conference (Twitter hashtag: #EBBC13). This is an annual gathering of the beer-blogging community to talk, listen and – of course – drink beer. The previous two conferences have introduced me to more than a few good brews, not to mention a few good friends. This year the conference is being held in Edinburgh so I thought it timely to share some info about the city’s beer tourism potential. If you’re going to #EBBC13 you’ll find some of these bars on the Thursday night pub crawl but if you’re not then please consider it a general guide to some marvellous places to get a beer in Edinburgh. It was an INCREDIBLY windy day when I headed up Lothian Road in search of the Hanging Bat which I had heard of, prior to its opening, via Twitter. I was literally nearly blown off my feet – and then subsequently blown away by this marvellous bar despite its somewhat inauspicious location (on Lothian Rd near the junction with Morrison St). Like many ‘craft’ beer bars it owes more to US style drinkeries than classic British boozers – but that’s not necessarily a bad thing. Nevertheless, expect lots of bare brick and sanded down wood panelling but also a range of seating (from comfy leather couches, to standard tables or high tables with bars stools) on three levels. Good people-watching opportunities are afforded by taking a window seat on the mezzanine floor. The bar boasts half a dozen cask beers at any one time, 14 keg options and a myriad of bottle options. Trendy spirits such as Sipsmith gin are also available – in fact there are 37 different gins on the menu along with 14 whiskeys (not all of them Scotch). Inside the food and drink menu The Hanging Bat declares, “Our staff are knowledgable and friendly so if you need any help picking a beer they will be more than happy to lend a hand.” I found this to be 100% accurate. I had a half of the Kernel’s Table Beer while I decided what to eat, eventually choosing the pulled pork with a side of very spicy butternut squash and which came in a dinky cardboard carton like a packed lunch. I washed it down with a half of The Pokies (which is how my Dad used to refer to the police) a 3.6% New Zealand hopped pale ale with a lemon curd aroma and lemony, somewhat dusty flavours and a big bitterness that calmed down after a few sips giving way to a pleasant maltiness which balanced the beer nicely; and chatted with assistant manager Jamie who told me all about the bar’s tiny brew kit on which their Canadian brewer creates limited edition beers once a week. Look out for the likes of rye IPAs and smoked stouts but beware they usually sell out within a couple of hours of being put on. 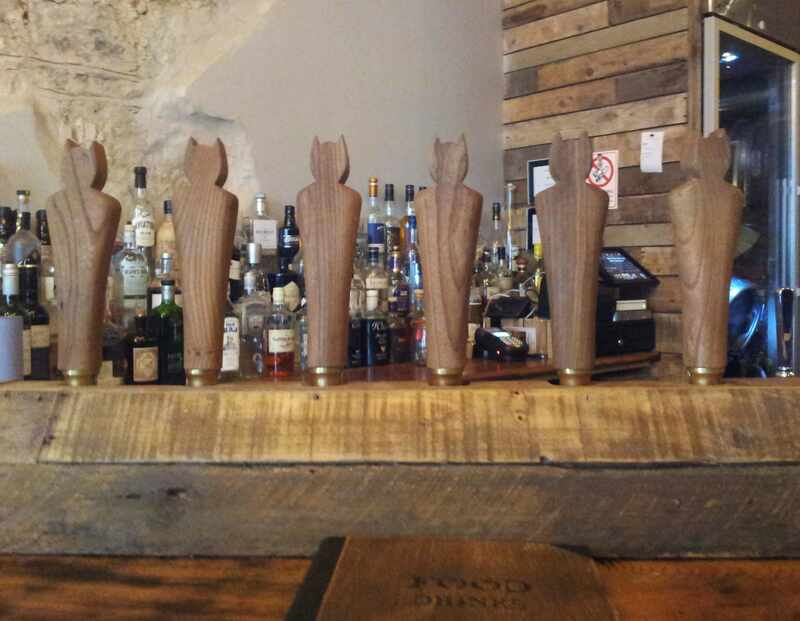 The Hanging Bat is an exciting, friendly and unpretentious place to enjoy a range of beers from around the UK, including some of the newer Scottish microbreweries such at Tempest and Elixir. You’ll find this bar behind Waverley train station. It has a much more pubby feel to it than The Hanging Bat and features a polished – if a little worn – dark wood bar and mahogany-like panelling. The lighting is low, almost to the point of being dingy – but don’t let that put you off. It made me recall my youth and my tendency to seek out the darkest corner of a pub to sit in! Choose from four cask and 20 keg beers here – although some of the kegs are mainstream, mass market lagers like Stella Artois or slightly better ones like Peroni. There is a good selection of ‘craft’ keg though, including several Williams Bros brews and the likes of Tempest’s Double Cresta Black – an 8.2% ‘four grain and nut’ stout which was the reason I squeezed in a trip to Holyrood 9a before I flew home. It didn’t disappoint, giving me stunning rich chocolate truffle flavours with little hints of liquorice and subtle palma violet notes too. 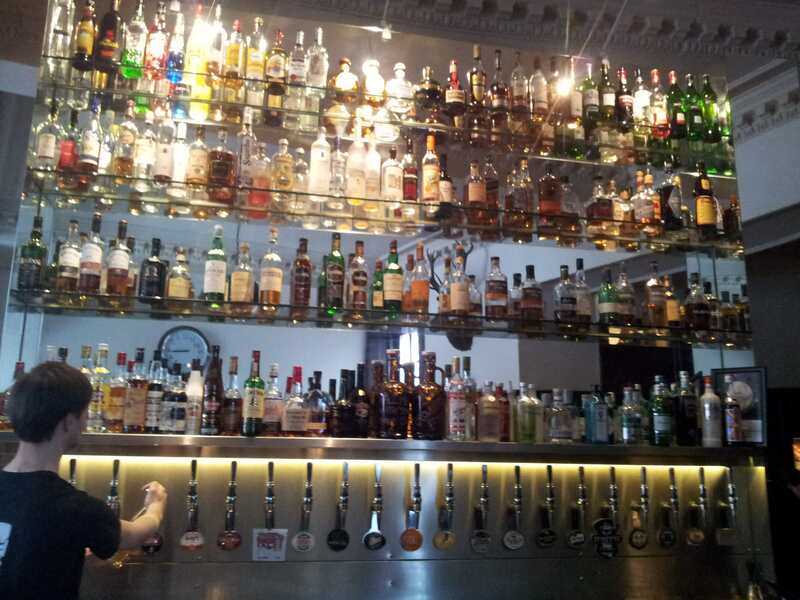 I wonder what happens when someone wants something from the top shelf at Holyrood 9a?! If you can’t find a good conversation to eavesdrop then order something from the highest glass shelf behind the bar and marvel at the agility of the member of the bar staff who has to climb up there to get it! Holyrood 9a is another testament to how friendly a city Edinburgh is and definitely worth a visit. Holyrood 9a is at 9a Holyrood Road, EH8 8AE. The Vintage, Leith – just a short bus ride (#22) from the city centre. DO NOT MISS GOING TO THIS BAR especially if you are a woman as it is about the only time I recall women outnumbering men in such a beer-orientated venue! 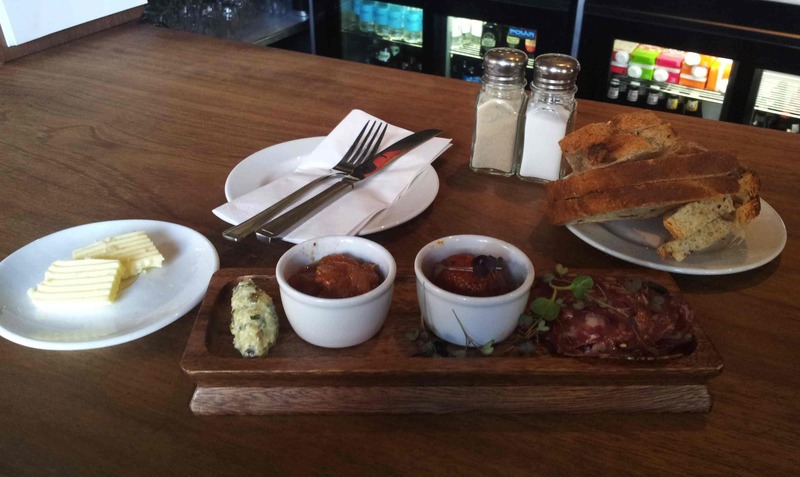 The Vintage is sort of wine bar meets craft beer bar with a fantastic charcuterie menu thrown in. Grab a seat at the bar if you’re drinking alone and have a chat with the bar staff – although they won’t mind where you want to sit if you prefer a table. You’ll find more keg than cask on offer here and take note they don’t serve pints. Only 2/3 ‘schooners’ and halves. Williams Bros has a good presence on the bar here – not just because they make fantastic beer but also because they have a stake in The Vintage – and there is also Camden Hells lager and guests such as Brooklyn Brewery Sorachi Ace (Wow! and 7.6%) which was on top form parading its big dill flavour. I also had Elixir Conviction IPA (5.5%) which was like chewing a handful of hops. It features Cascade, Challenger and Chinook and is then dry-hopped with Stella producing a waxy, bitter grapefruit flavour that wouldn’t be for the faint-hearted. I followed it up with a Williams Bros Black Ball Stout (4.2%) which had milk chocolatey flavours and is much lighter than their Profanity Stout but still jolly tasty. Be sure to order some food as you will be missing out if you don’t eat here. I had the wild boar salami and some amazing spreadable chorizo. The Vintage is a classy place to drink that still manages to be down to earth and genuinely friendly so make sure you GET ON THAT BUS TO LEITH or you will be missing a treat. The Vintage is at 60 Henderson Street, Leith EH6 6DE. That wraps up Edinburgh beer tourism part one (as I was only in town for about 36 hours). I hope to be able to bring you part two after #EBBC13.